Putu was terrific. We were with him for 3 days. 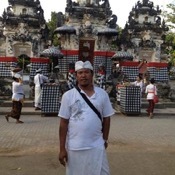 This particular tour to Ubud was excellent. Whatever the venue Putu was reliable, accommodating, friendly and a treasure trove of information about local religion, customs, family, flora and fauna etc. etc. In view of some of the congestion and travel conditions his vehicle and driving skills were a welcome bonus. His car works well with 2 or 4 people. We had a great time.